Where do these cute little guys come from, anyway? It probably won’t surprise you to learn that these cute little dust balls aren’t actually bunnies! 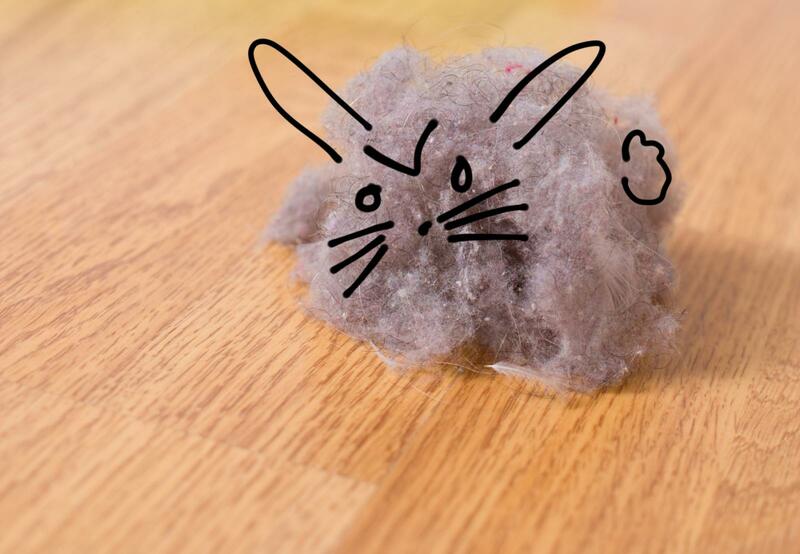 The exact composition of a dust bunny can vary depending on area, weather and season. Typically, house dust is composed of stuff like dead skin cells, hair, pet dander, carpet fibers, clothing fibers, pollen, dead insect parts, and other particulates that entered your home through the windows and was tracked in on the soles of shoes. Dust bunnies are usually held together in clumps because the fibers that compose them become entangled and get matted, much like lint does. There are also electrostatic forces between the dust particles themselves that help the bunnies form in the first place. They can actually be a little bit gross! Keep dust bunnies under control with regular vacuuming and dusting. Vacuum with a machine that has a HEPA filter. HEPA stands for high-efficiency particulate air filter. HEPA fliters are designed to trap most of the fine particulates in the machine, so they aren’t simply spewed them back into the air. Make sure to use the vacuum attachments every few months to reach dust that lurks under furniture, in sliding glass door tracks, behind the refrigerator and under other large household appliances. Metro Cleaning Service Albuquerque recommends using a microfiber cloth, dusting mitt, or a refillable duster instead of a feather duster. While feather dusters can be great for dusting delicate items such as figurines and small glass objects, they don’t do a great job at trapping dust. Dusting sprays can be a good choice when used in combination with a microfiber cloth. Here’s hoping all your bunnies may be made of Chocolate! Visit us and like our page at https://www.facebook.com/MetroCleaningServiceAlbuquerque for more cleaning tips! Metro Cleaning Service Albuquerque is a commercial janitorial service and office cleaning company that serves Albuquerque and the surrounding area. ← What Is Dirtier Than A Toilet Seat?